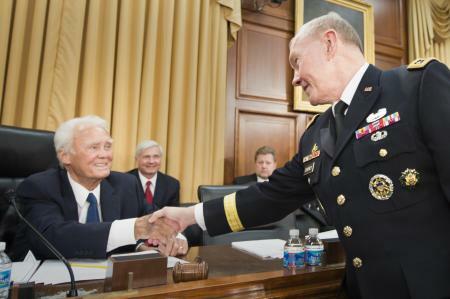 Chairman, Joint Chiefs of Staff, greets Congressman Bill Young on April 16. Defense Department photo. Rep. C.W. Bill Young, whose Florida district abuts MacDill Air Force Base, is “gravely ill,” according to his family. Young, who has served in Congress for more than 40 years, is currently chairman of the Appropriations Subcommittee on Defense. The 82-year-old lawmaker recently told the Tampa Bay Times that he will not run for reelection in 2014, citing health concerns. On Thursday, Young’s family issued a statement that his health was failing. In January, Young told Air Force Times he was bitterly disappointed that MacDill Air Force Base was not being considered to host the KC-46A tanker. “I told Gen. [Mark] Welsh that I felt like I had been misled over these many years as we developed this program,” he said at the time.